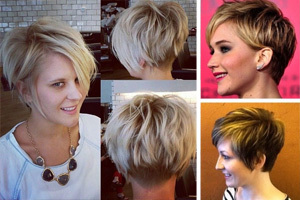 These trendy, short, straight hairstyles will help you create a new image that’s full of flattering fashion-flair! 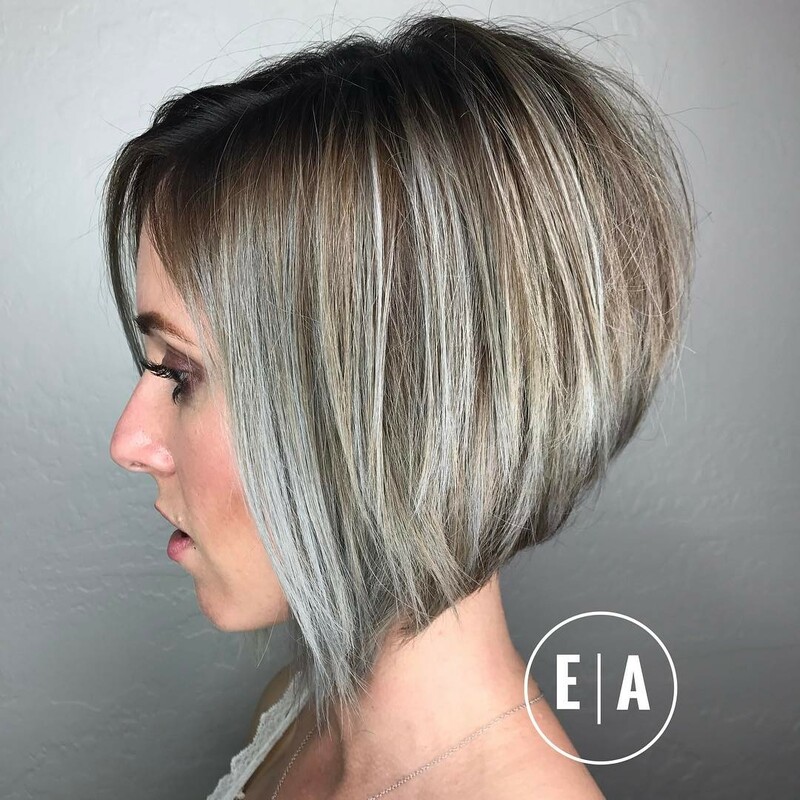 Today’s short straight hairstyles offer easy-care haircuts to update even the frumpiest of us to a smart, fun or sophisticated new look. If you look in the mirror and don’t see the hairstyle of your dreams, change it right now before it saps all your confidence! Here are the season’s latest hairstyles and exciting color trends – just waiting to boost your confidence and ensure you always look your best! This A-line, angled bob is a classic cut suitable for thick, medium and fine hair textures. The style is cut in long layers, with the tips cut into a concave texture to make hair curve under at the ends. The blonde balayage-ombré is a careful blend of neutral beige-blonde tones with light-blonde accents creating color depth. 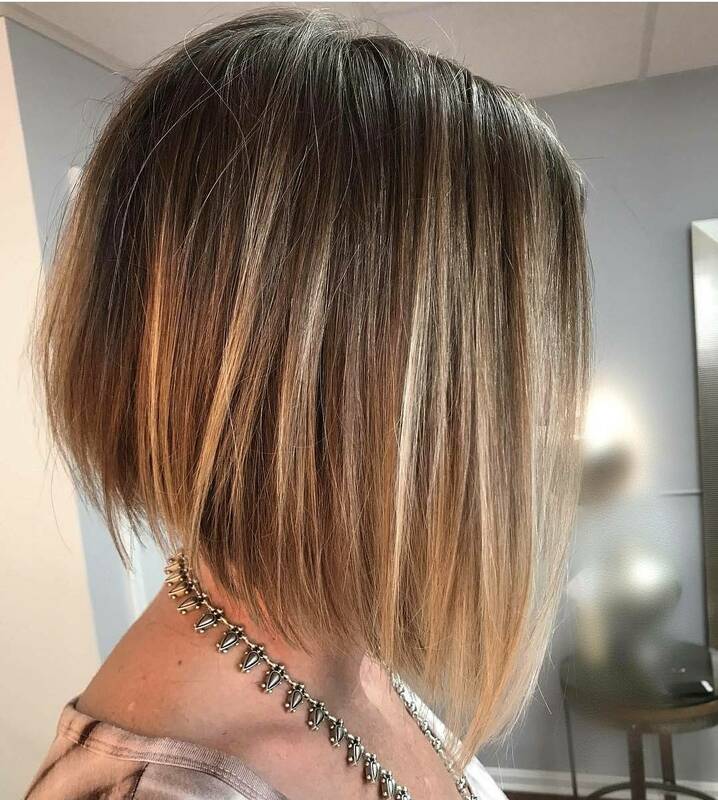 I love how it moves from dark to light vertically, and horizontally, from a darker back section down to flattering neutral blonde around the face! This shorter version of the angled bob is best achieved on thick or medium hair, as you need natural volume for the lovely rounded back. This is a smart and trendy hairstyle showing off the very latest color options for brunettes! Broad bands of gray-blonde highlighting have been mixed with beige balayage and fine, white lines. These shades of light and dark create the 3-D look of thicker hair. And the fabulous blue-gray strands around the face emphasise brown-eyes beautifully! 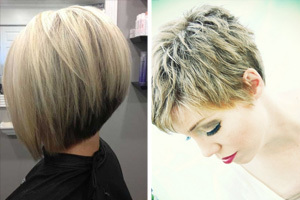 Short hairstyles with plenty of layers are one of the most popular fashion hairstyles for fine hair. As you can see here, you can change long, lank hair into something much more exciting! Short, choppy layers at the back have been contrasted with longer, sweeping strands around the face. And along with the disconnected layers on top, this creates tons of texture and movement. Pastel shades in faded pink, ivory and neutral-gold finish this flirty, boho look! I love this asymmetrical, fusion hairstyle matching a sophisticated, angled bob with these playful colors! 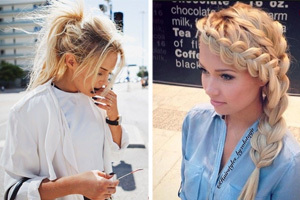 It’s lots of fun and a great hairstyle for a party or nightclubbing. This style looks best on thick or coarse hair that has sufficient density to sculpt the back into stacked layers. But the exaggerated curve at the back is just one major style feature, as the sweeping line down to the front is also a show-stopper! 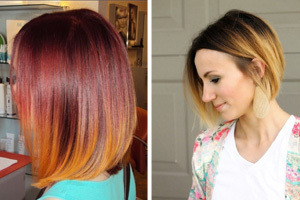 So when you add burnt-orange roots and a soft, pink-blonde ombré – you’re sure to be the belle of the ball! Copper, orange, ginger and auburn shades are a really popular trend this season! And I’m delighted, ‘cos there always seems to be so much emphasis on expensive, blonde hairstyles. Apart from being a very attractive hair color in itself, intense copper’s also one you can easily do at home. If you don’t like hair-dye chemicals, use natural henna powder in Copper to get this exact color. 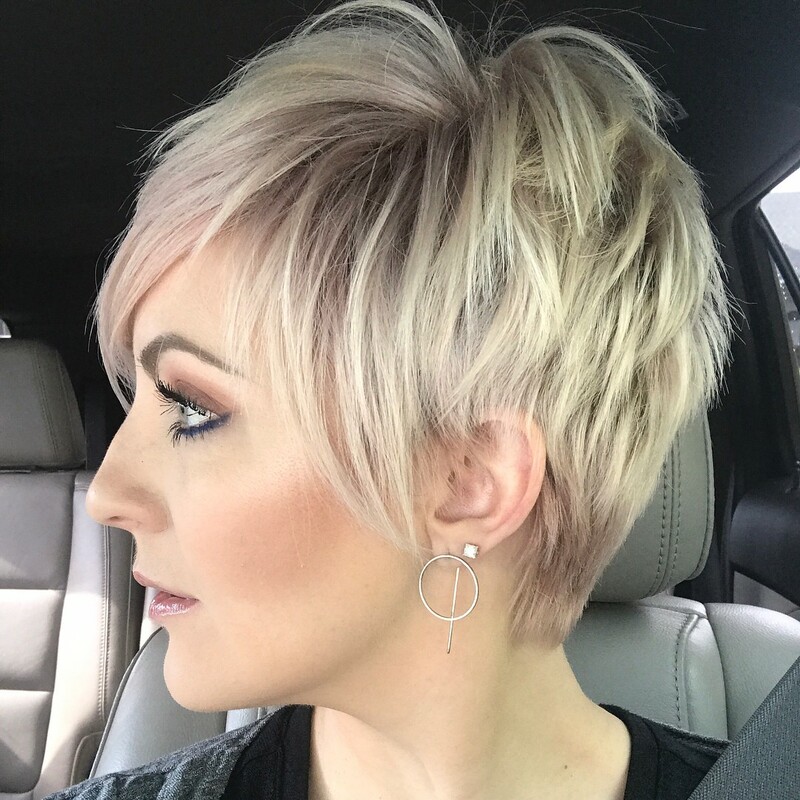 The style is equally hot, with a face-flattering, swept-across fringe, and long, defined side-points parted to show the ears! We all love a good makeover idea! 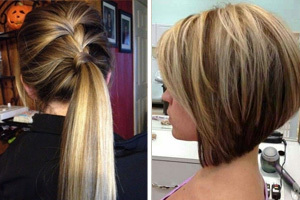 ‘Cos a good haircut-and-color makeover is the best way to look younger without surgery! Long, healthy hair is lovely – but it can be a bit boring and time-consuming. This model has changed her so-so image to a younger look that’s packed with style. 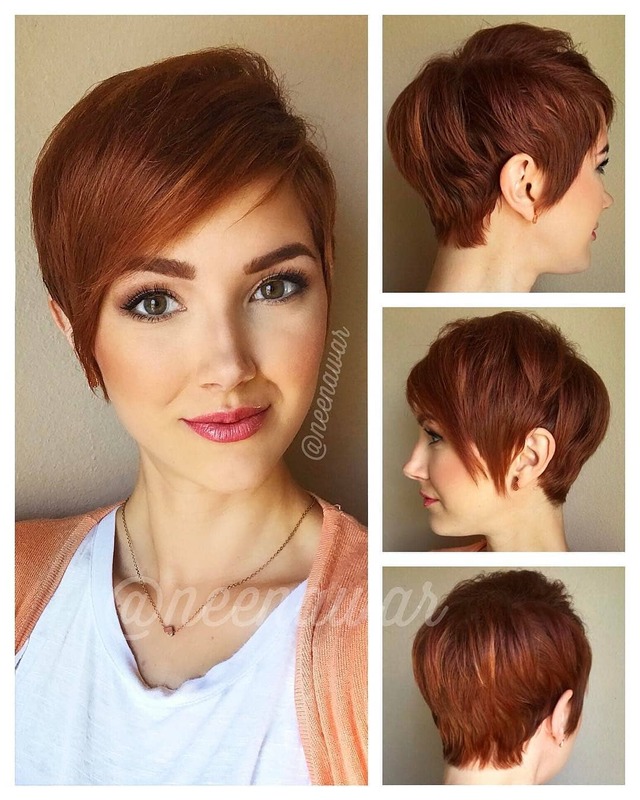 And so can you with this short, sporty haircut in gorgeous medium-copper! Long layers on the top and crown have been tousled to create casual texture and color-depth. 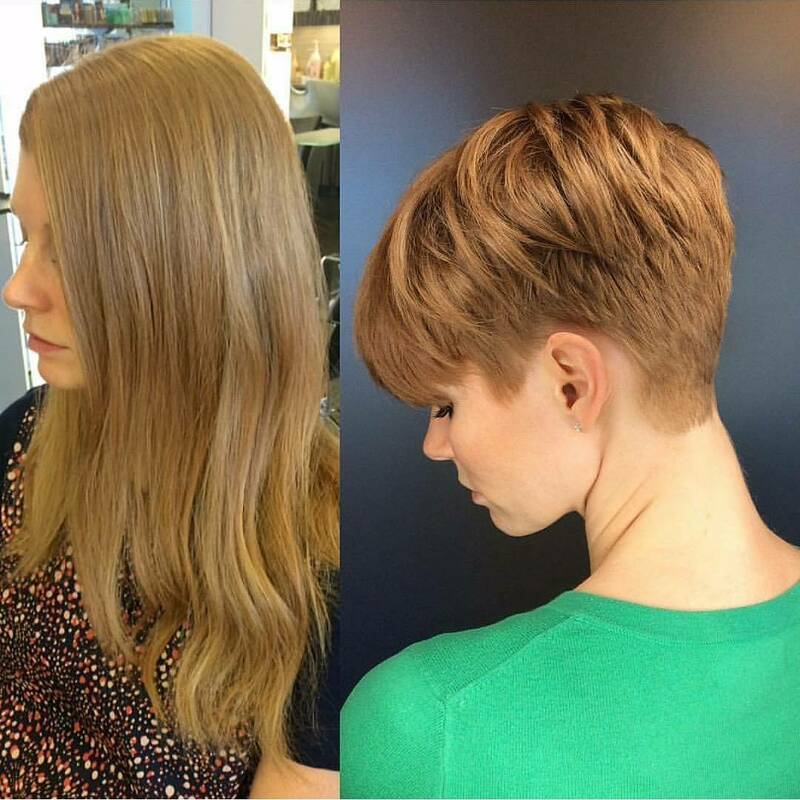 And neatly cut sides and nape show off a pretty profile, head shape and neck for a youthful, new look! 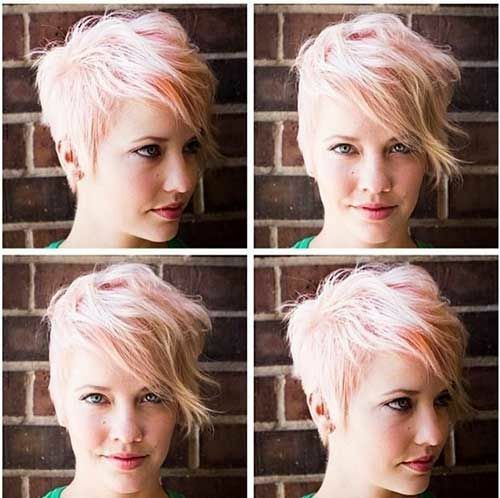 Fine hair, in a fairly light natural shade, is perfect for this shaggy, pink short cut that’s packed with personality! The deep side-part is blurred above short layers and a long, pointed side-point. The extra-long fringe cuts across the face and a little further, making the middle of the face and the eyes the focal point. This flatters long and heart-shaped faces by drawing attention away from a high/wide forehead or a narrow chin. There’s no added height on top, but waves create interesting texture and movement. 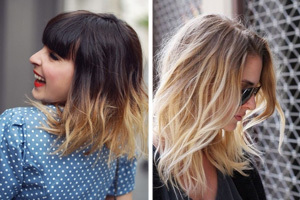 Just add a mix of white, apricot and pink blonde balayage for a super-cute image! 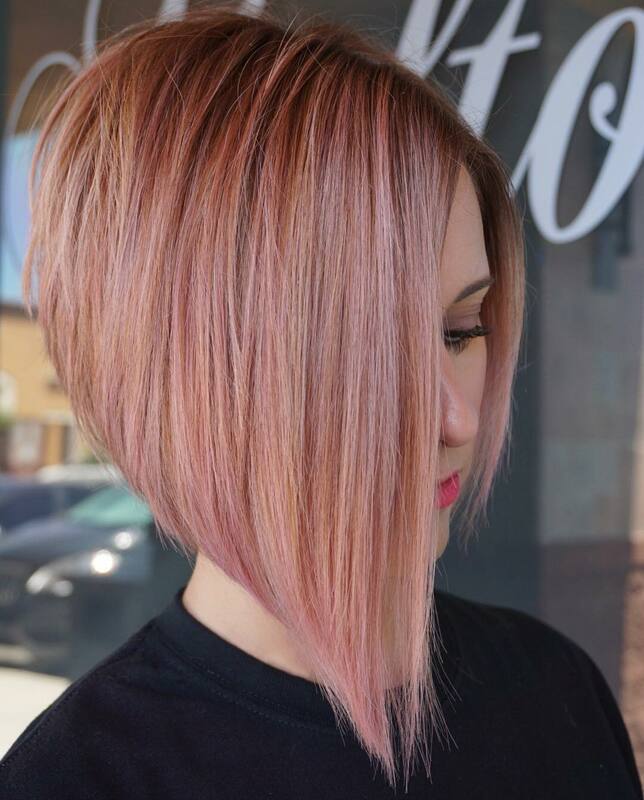 This innovative short haircut is a fab blend of cutting technique and color creating a chic new pixie! The main shape is a fauxhawk, with long layers from forehead to nape. Instead of a shaved ‘undercut’ the sides are short, which softens the look, along with the gentle colors. 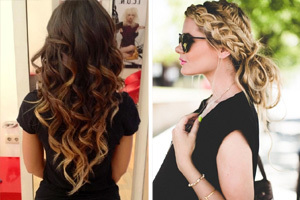 The top and back are light, beige-gold blonde that is beautifully complemented by light-brown roots. The fringe is expertly cut to create defined, separate strands across the forehead, balancing the chin. This style is suitable for minimising a strong jawline/broad forehead. This rock-chick look creates a super-cool image and is incredibly easy to maintain, too! The cut is a traditional male short-back-and-sides, without side points, tinted black for maximum contrast. The crown has volume from short layers and the long, top layers are styled forwards into a long fringe. 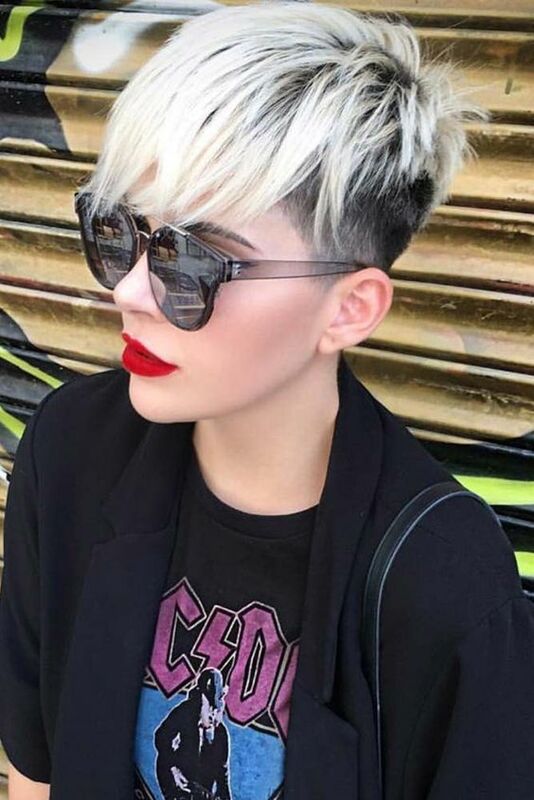 It’s an attractive variation on the platinum-blonde/black roots street look, that’s now a modern classic! And a great way to show off a good bone-structure and dainty face. 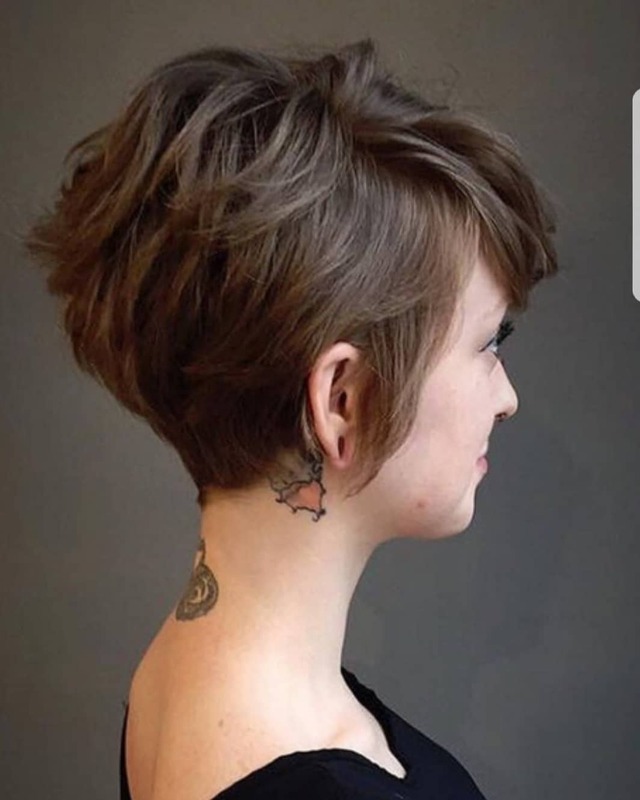 This stacked back short haircut is great for anyone blessed with thick hair and a little natural wave. Natural volume around the crown and back curves in to create a lovely line down to a short nape. The side part can be adjusted to suit any face shape and hairstyles at ‘chin-length’ are great for women of all ages! With a long, side-swept fringe and the season’s favorite new twist – bare ears between parted strands – this is a lovely, natural look!